BelarusDigest > All > Prison terms for football hooligans: coping with violence or political repression? 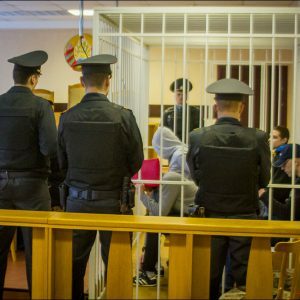 On 10 March, a court sentenced six football hooligans to lengthy jail sentences for a fight between fans of FC Partyzan Minsk and a rival group of ultras which occurred in June 2014. The football fans received particularly severe sentences of twelve, ten, six and four years in jail. In sentencing the leftist hooligans to imprisonment, officials intend to keep anarchists and football ultras off the streets during the countrywide social protests which started in Minsk on 17 February. Despite the fact that human rights organisations have not recognised the ultras as political prisoners, the sentence can be seen as political motivated. Fans of the currently defunct football club were well-known for their antifascist views and had links to the anarchist movement. In June 2014, a dozen hooligans of the former FC Partyzan Minsk attacked a group of Tarpeda Minsk fans heading to a match on public transportation. During the very short altercation, which did not last much longer than a minute, they smashed the trolleybus's windows, sprayed tear gas, and tore the jacket of one of the Tarpeda fans. No bystanders were injured. Tarpeda supporters did not appeal to the police and continued on their way to the match. Minsk City Transport estimated that the damage came to only $15, which the youngsters paid shortly after the scuffle. Nevertheless, for this incident the football hooligans received long prison terms almost three years later. Independent journalists called the prosecution of the football fans an 'antifascists case', pointing out the left-leaning ideology of FC Partyzan ultras and their links to the anarchist movement. Most commentators agree that the real cause of such a severe sentence was the political ideology of Partyzan fans. Ten days after the incident, the police detained around five suspects, some of whom spent several days under arrest. They were released shortly after. In 2015, the Department for Combating Organised Crime, notorious for its fight against extremism in football subculture, decided to reopen the case. This time, the lawsuit included charges for unregistered organisations and drugs. In February 2016, police detained two participants of the brawl, Artiom Krauchanka and Andrei Chartovich, for drug trafficking. The main witness for the case, Aliaksandr Klachko testified from prison while serving time for drugs. He stated that the youngsters had purchased 12 grams of hashish and shared it amongst themselves. The accused fans did not profit from the deal and bought the substance (legal in some countries) for personal use. Nevertheless, this offence, in conjunction with the fight in the trolleybus, lead to twelve years in prison for both of them. Another key figure of the case, Iliya Valavik, received a ten year sentence. According to investigation he had moderated football hooligans groups on social networks. 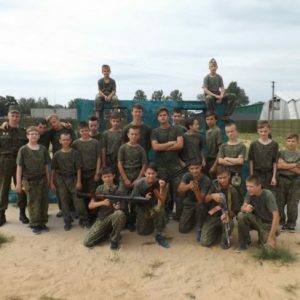 This activity led the prosecutor to accuse him of leadership of a non-registered organisation, a criminal offence in Belarus. Three more defendants were found guilty only of hooliganism and received jail terms of four to six years. Most of the accused stated during the trial that investigators had exerted pressure and intimidated them. For example, Iliya Valavik stated that during the interrogation, investigators had threatened to open a criminal case against his pregnant wife. During the trial, the defendants rescinded their testimonies, claiming they had been under pressure from police. Moreover, all victims of the trolleybus fight which the police were able to locate stated during the trial that they do not see themselves as victims and have no claims against the defendants. Both independent and state media covered the trial. Belarusian Television aired several reports on the case. According to state journalists, ten passengers had asked for medical help after the incident. This simply isn't true. In one report, a police official claimed that the defendants had rescinded their initial testimonies because they 'hired an expensive solicitor' who told them to do so. Thus, according to the police, the fact that defendants made use of their right to take back testimonies in court is proof of the cunning hypocrisy of the prisoners, not evidence of the intimidation and torture they experienced in jail. The independent media criticised the court sentence, but this did not lead to public support for the accused football hooligans. The presence of drugs and violence scared off human rights organisations, which refused to recognise the youngsters as political prisoners. The only group which supported the antifascist hooligans were anarchists. They organised several small street protests and posted transcripts of court hearings on the internet. Obviously, the football fans' offence does not correspond with the penalty. The highest prison sentence for Russian football hooligans who organised disorder in Marseilles, an incident which involved death, was just two years. In nearby Poland and many other countries, football violence generally leads to a ban on attending matches. Usually, Belarusian police treat fights between football hooligans as administrative offences. The most severe punishment for such misconduct is normally fifteen days in prison. For this reason, the 'antifacist case' can be regarded as part of a coercion campaign against radical left activists. This includes the criminal prosecution for participation in the Critical Mass cycling protest and graffiti case in 2016. It seems that under different circumstances, the football hooligans' punishment would not be so severe. Unfortunately for Partyzan fans, the trial coincided with the 'social parasites' protests which started in Belarus in February. Anarchists took an active part in most manifestations and even led the protest in Brest. Therefore, the court sentence can be seen as a warning to anarchist activists and well-organised groups of ultras to keep them off the streets during protests.